Horsetail (Equisetum arvense) is the last remaining descendant of the giant ferns that covered the earth over 400 million years ago. The plant has an unusual root, shoot, and stem system that enables it to absorb and store silicon and other minerals. Horsetail plant is possibly the most abundant source of silica in the plant kingdom with up to 15% vegetal silica. This venerable plant, thought to have magical properties due to its extraordinary effectiveness, has been used for thousands of years to treat a variety of ailments. Our organically crafted Horsetail Butter is a premium quality extract of the aerial parts of the Equisetum arvense plant, cultivated in India, into our proprietary exotic butter base to produces a pale green colored, soft butter with a rich, elegant skin feel. This bio-available silica in Horsetail Butter, when applied topically, can greatly aid in the healing of wounds and burns, and has a softening and smoothing effect on the skin. 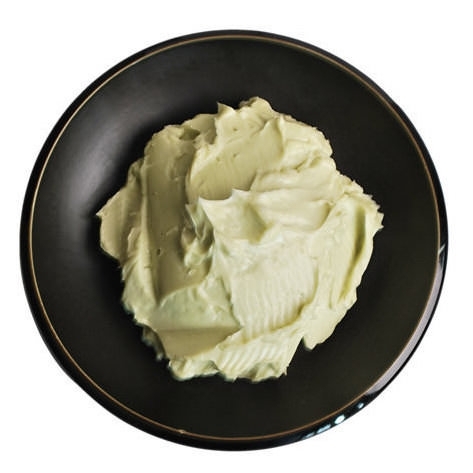 Mineral rich Horsetail Butter contains the building blocks needed for collagen and elastin synthesis, thus greatly enhancing the rebuilding of connective tissues in the epidermis. It also contains flavonoids and saponins which help rebuild and regenerate damaged skin cells. Silica also helps to strengthen weak, brittle, damaged hair and improve the elasticity in the hair, making them appear shinier and less frizzy. Horsetail Butter can also help stop dandruff, split ends, and hair loss as well.